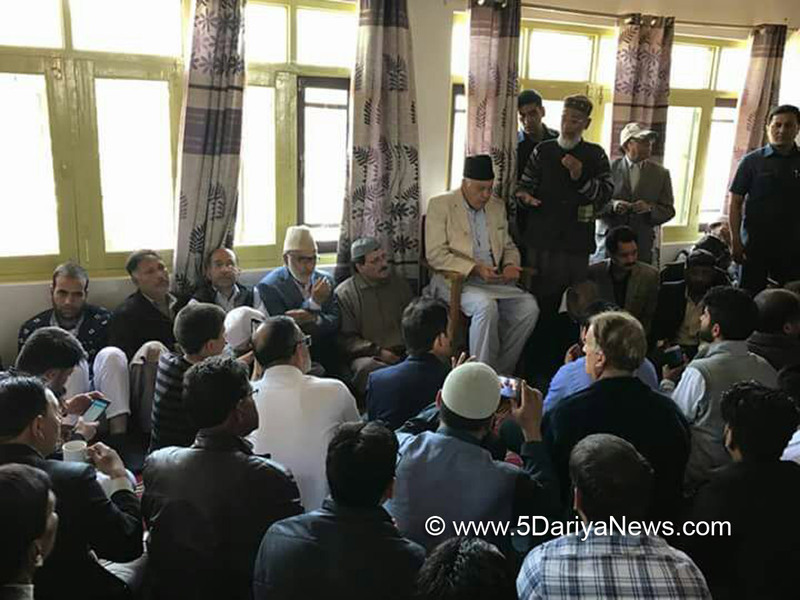 National Conference Chief Patron and former CM of J&K state Dr. Farooq Abdullah today express deep sorrow and grief over the tragic and untimely demise of former Speaker, J&K Legislative Assembly and present MLA from Iddgah Constituency JB. Mubarak Gul's, Sister-In-Law namely, Ms. Shahzada Nissar, wife of Mr. Nissar Ahmed Gul, who died after a brief illness at (AIIMS) All India Institute of Medical Sciences in Delhi. Dr. Farooq Abdullah described it as a "Shock and unspeakable grief ". He added our hearts go out to JB. Mubarak Gul and other members of the bereaved family. It is impossible for me put in words how deeply this terrible bereavement has affected me personally and everyone else, who knows Gul family ".Expressing his sympathies from the core of his heart, Shiromani Akali Dal, Senior Leader and party Senior Vice President and Lok Sabha MP from Khadoor Sahib constituency in Punjab, Ranjit Singh Brahmpura, in a separate message he said, It was a tragedy beyond anyone's imagination and I share my heartfelt Condolences with the bereaved family in this hour of grief ". Meanwhile, MP Ranjit Singh Brahmpura sentiments were conveyed to JB. Mubarak Gul by his (OSD) Officer on Special Duty Mr. Damanjeet Singh.Damanjeet Singh also offered his Condolences to the bereaved family and described this shocking incident as a 'grievous personal loss and tragedy too deep years ".Dr. Farooq Abdullah and MP Ranjit Singh Brahmpura and Joint Secretary Hockey J&K, JB. Raja Ghulam Nabi Wani and Mr. Damanjeet Singh (OSD) MP Lok Sabha (Khadoor Sahib) prayed to the Almighty God to give courage to the bereaved family members in this hour of tragedy to bear this irreparable loss and grant peace to the departed soul.On this grief moment many prominent persons Viz. JB. Ali Mohammed NC Gen-Sec, Former NC MLA JB. Nasir Aslam Wani were also present.